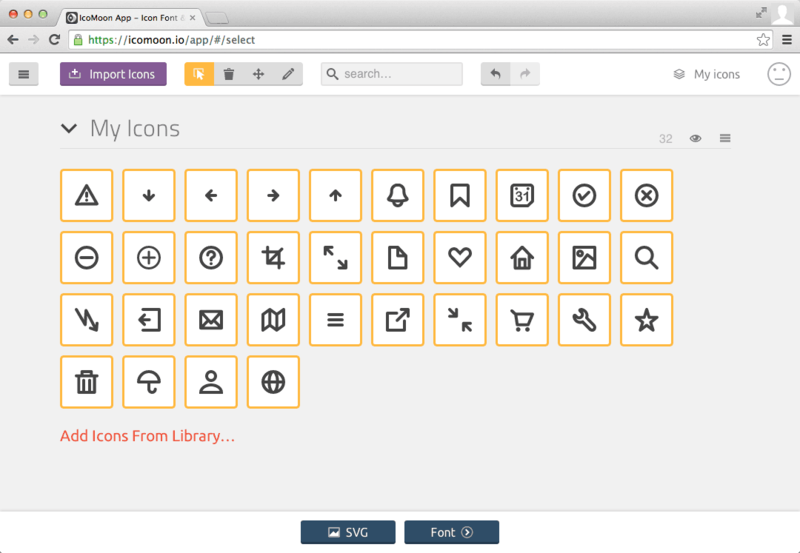 An icon system can often become central design element in your web project. You can find many free or commercial icon sets on the web, and they are often included in major CSS frameworks (Bootstrap 3 Glyphicons is a perfect example). On some occasions, however, you may need more specific glyphs not included in a generic set. Or you may just want to better coordinate the design of your icons with the other design elements of your project. In these cases you’ll want to draw a new icon set from scratch. Today I’m going to cover web fonts. We’ll cover the use of SVG in another article. Traditionally font creation had been known as a difficult and demanding task, but thankfully building icon font sets, has become considerably easier thanks to easy online tools such as IcoMoon, Fontastic, or Fontello. 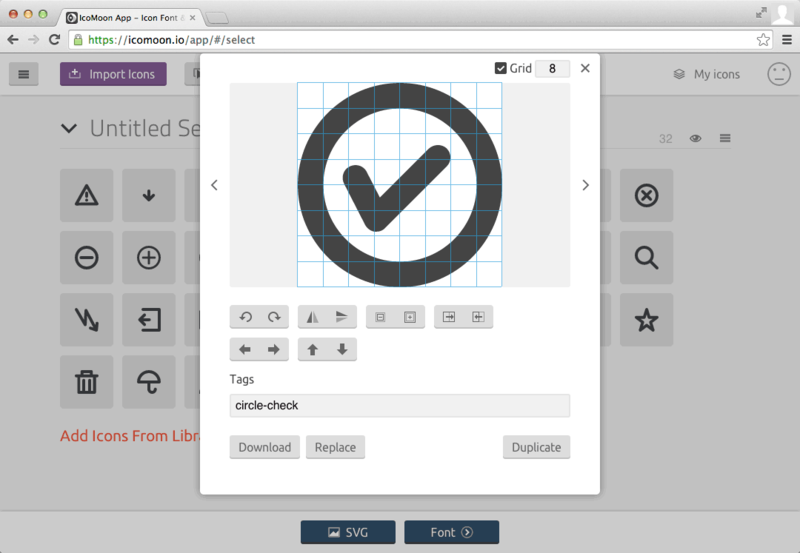 Each allows you to build a font by either ‘cherry-picking’ pre-built icons from public libraries, or by uploading and compiling SVG files you’ve prepared yourself. To build your own icon font, the first step is to design icons – we will use Illustrator for this task – and then save them as SVGs. Before you start drawing, you need to define style properties for your glyphs such as stroke sizes, grid proportions and so on. Begin by doing some readability test at different sizes and build a template you will use to draw all your glyphs. It’s no use designing finely-detailed icons that don’t work at lower resolutions. It’s also very useful to sketch your font before drawing, also a very rough sketch (like the one below) will help you to find ideas for all the symbols you need. You can then to decide on a grid size for your glyphs. 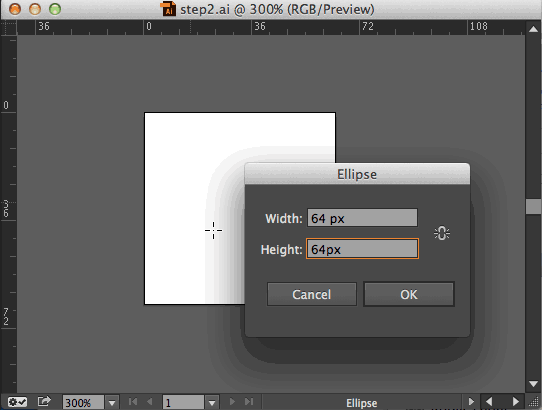 My tip is to not draw directly at your target size (for example 16x16px) or at very big sizes either. Instead I’ve found that a grid of 60-80px side is often good for me. Scaling up or down from this size is generally successful. Of course, this is not a ‘set-in-stone’ type rule: project needs and experience may change on a case by case basis. For this article, I chose to draw my icons with a stroke of 8px, without fill and set inside a grid of 64x64px. Illustrator artboards are very useful for this job: you can draw each glyph in a different artboard, keeping each in a single file. The artboards can be rearranged, renamed and can be exported as standalone SVG files (which is precisely what we need for IcoMoon). Each artboard can also have independent axis coordinates, that will be very valuable for objects alignment, as we will see later. Note that you can start create all the artboards you need using the Number of Artboards option: I prefer to add artboards as I need them, but there is no reason why you can’t create all your artboards first. Now we can set up the grid. We want it to start from each artboard origin (the top-left corner) and to divide the artboard into a 8×8 checkerboard. Before doing that, let’s take a quick look at the way the Illustrator coordinates system works. 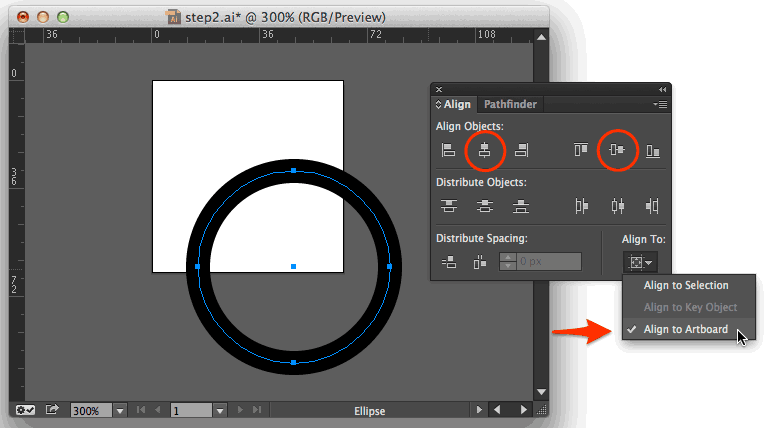 Illustrator workspace is composed of a canvas that contains one or more artboards. Artboards are placed on the canvas starting from a point called the Global ruler origin. In addition every artboard has its own origin point and rulers as well. 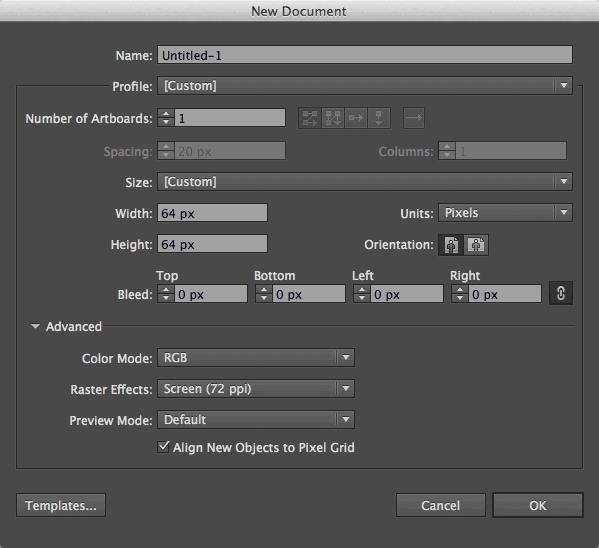 When you’re positioning new artboards using the Artboard tool, you will always use the global ruler. In almost all other cases, you will use the artboard ruler according to View → Rulers → Change to Artboard (or Global) Ruler option. If you are using the Global ruler, every object you draw on any artboard is drawn in relation to that single origin point (i.e. the Global ruler origin). Otherwise coordinates refer to the origins of the artboard which contains it. 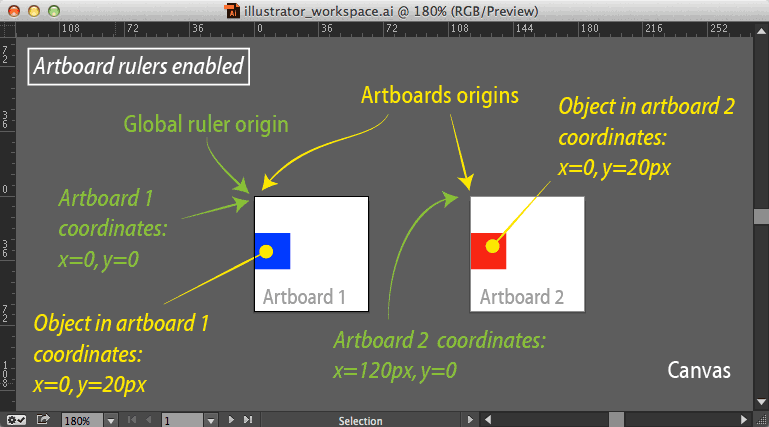 The objects we draw are placed in an artboard according to the Artboard ruler origin (in the screenshot below, you can see that the two squares have the same coordinates values even if they are placed in two different artboards). For this job, we will use the Artboard ruler, since it is more suitable for glyphs alignment. 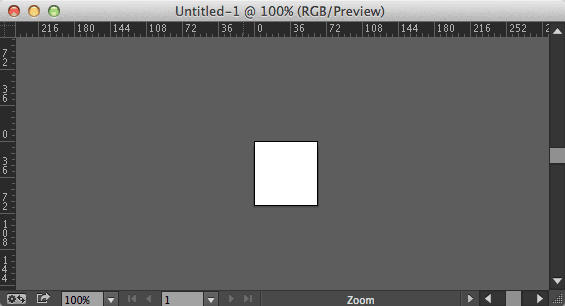 Now we have to ensure that our grid matches exactly our artboard. 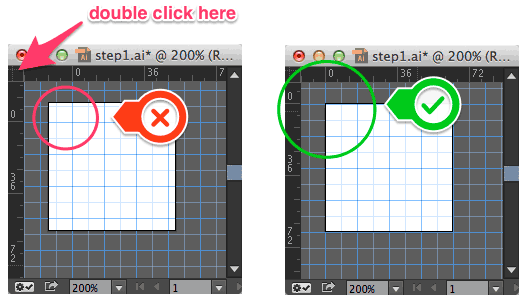 By default, the first artboard is placed at global ruler origin, but, since artboards can be moved and reset: to do this simply double-click the ruler origin with the artboard tool. But the result isn’t quite what we expected: Illustrator aligned the path without computing the stroke width. 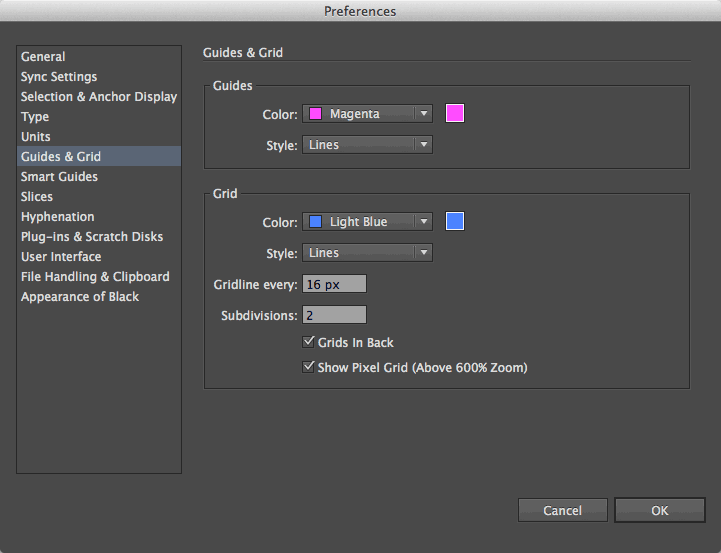 Thankfully, this can be easily resolved, setting the Use Preview Bounds option in the Preference Panel. 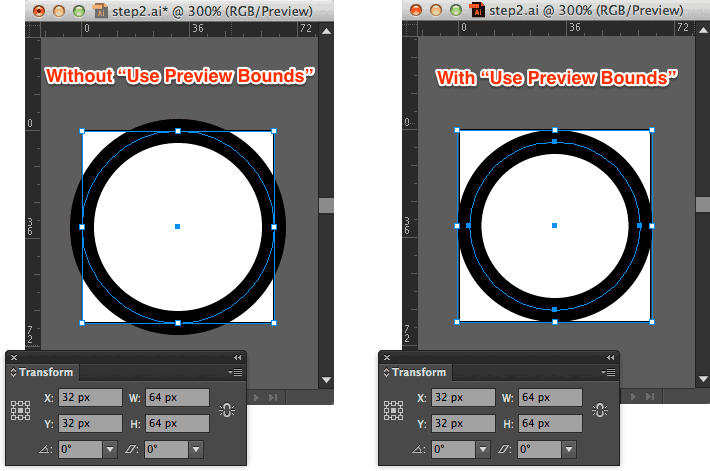 Now Illustrator will compute stroke widths inside the artboard regardless of aligning and resizing, and this makes drawing quicker and more accurate. We now have to draw each glyph, adding a fresh artboard each time. You can add an Artboard using the Artboard tool and option/alt dragging an existing one or clicking the New Artboard icon in the Artboards Panel. 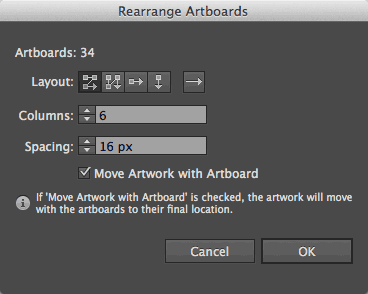 Artboards can then be easily rearranged by choosing Object → Artboards → Rearrange (or the Rearrange Artboards command in the Artboards Panel menu) following the order in the Artboards Panel. Note that glyphs are always uploaded in alphabetical order, so keep this in mind if you want the artboard order in Illustrator to match the glyphs order in the font. Give to each Artboard a name (no spaces): this will become the name of the glyph and also the class names of the generated CSS, so it’s very important to use meaningful words for them. You can use the Expand command to convert paths to filled shapes, and the Pathfinder panel to quickly combine overlapping shapes into single elements. Once our glyphs are ready, we can save each one as a distinct SVG file by using the Use Artboards option in the Save as dialog. Illustrator saves SVG files by prefixing their names with the .ai document name (icons_). Since IcoMoon uses files names for glyphs, I prefer to remove this prefix (there are a lot of small applications to easily rename all files) to reduce any confusion. 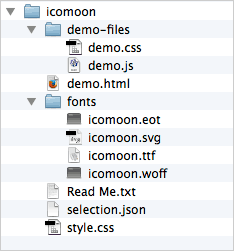 The IcoMoon site provides an online app to build icon fonts. 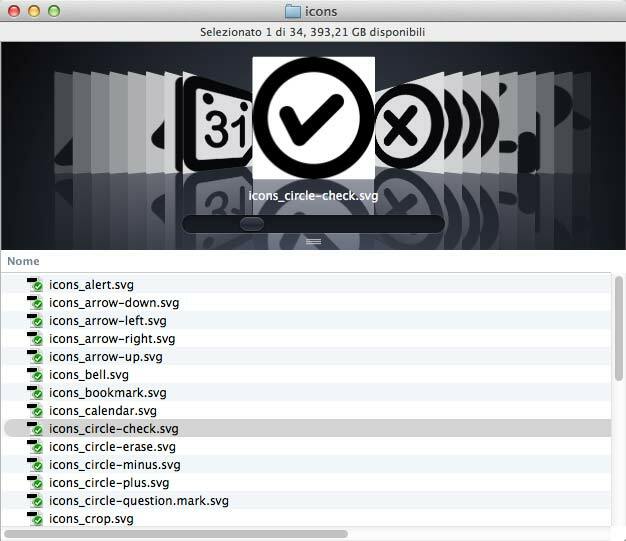 The app starts with an Untitled project with access to some free icon libraries from which you can choose symbols. Since we will upload our own glyphs, we can remove all preloaded libraries using the small menu at the right of each of them (note that this is not mandatory, since only selected symbols will be added to your font). It just keeps your project clean. You can then save your project clicking the Manage projects icon on the right of the app menu bar. Note that with IcoMoon free accounts, your project will be stored locally in your browser, so, you won’t be able to access it elsewhere until you download the project data (a JSON file) or upgrade to Premium account (that allows you to store projects in the cloud). 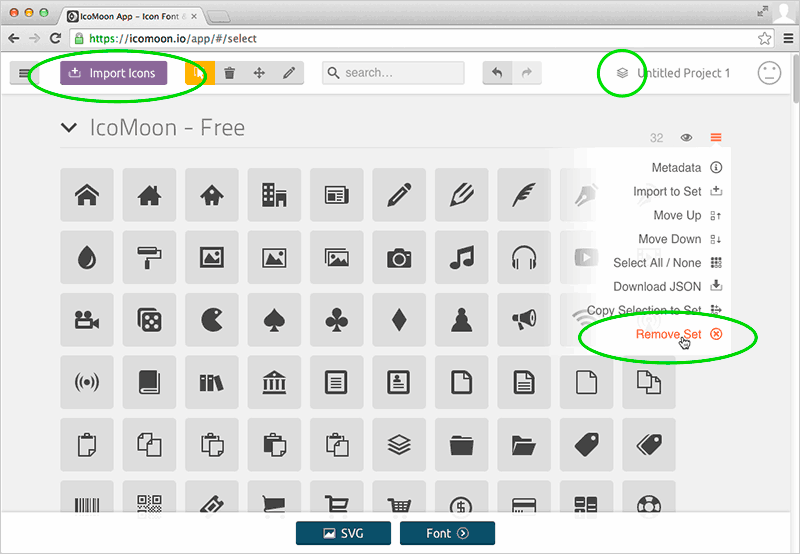 Now, you can upload your SVG files using the Import icons button: your glyphs will appear in the app as a Set. 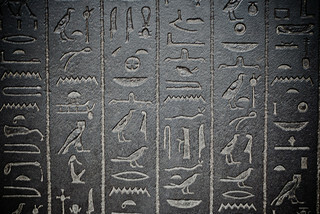 It’s easy to rearrange, delete them or edit each glyph using the tools provided by the app at this stage. You can also edit the set metadata (the name of the set and some author info) or perform other tasks using the small menu at the right of the set. Icons can be edited in the app using the edit tool. You can’t alter vector data in this way, but it is possible to resize or move the glyph, download the SVG file or replace it. To build your font, you’ll first need to select all required icons using the select tool (or just Select All/None command in the Set menu if that suits). You’ll be able to identify selected glyphs by their yellow borders. Then you must click the Font button at the bottom of the page. The app will load a secondary window with all selected symbols, displaying for each of them the glyph, the name, and the Unicode point that IcoMoon assigned to it in the PUA range. The use of the PUA range is considered the safest unicode sector to host your icons, although IcoMoon lets you use the standard Basic Latin range, if you like, by clicking the Codes button in the top bar. Before downloading your font, add a font name (this will be used in the @font-face rule), and Class Prefix and/or Postfix (that will be used as selectors in the generated CSS). 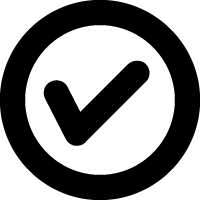 There are many other parameters you can set: from Metadata info to Metrics values, I recommend to read carefully the short and well explained documentation to set properly all of them. Your icon set is done! 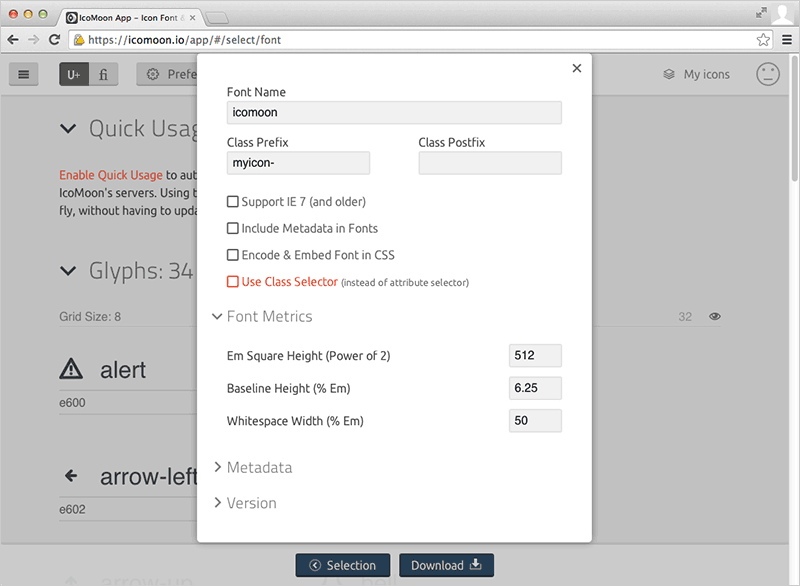 Download your font (or, if you have a premium account, simply link to the CSS) and add it to your project. The downloaded .zip file contains the font in various formats, a demo file you can use as a reference, a .json file that can be re-uploaded to restore your project (to view it into another computer, for example), and, of course, a .css file encoding your icons. The CSS (you can see an example below) contains the @font-face rule and all your symbols selectors. I’ve found this is a very quick way to build an icons font, but it certainly takes time to find the perfect workflow, and to test all options that both Illustrator and IcoMoon can offer.